Leaving aside the ambition of policy makers around the world, let us see the ground realities, GVA growth rates of Agriculture & allied, Industry, and Services sector at 2011-12 prices,were 4.37%, 5.77%, and 7.87%, respectively in year 2016-17. The size of 3 sectors is different. At 2011-12 prices, composition of Agriculture & allied, Industry, and Services sector are 15.11%, 31.12%, and 53.77% respectively. We can assume that to grow overall at 9% level, Service Sector needs to outpace other sectors. 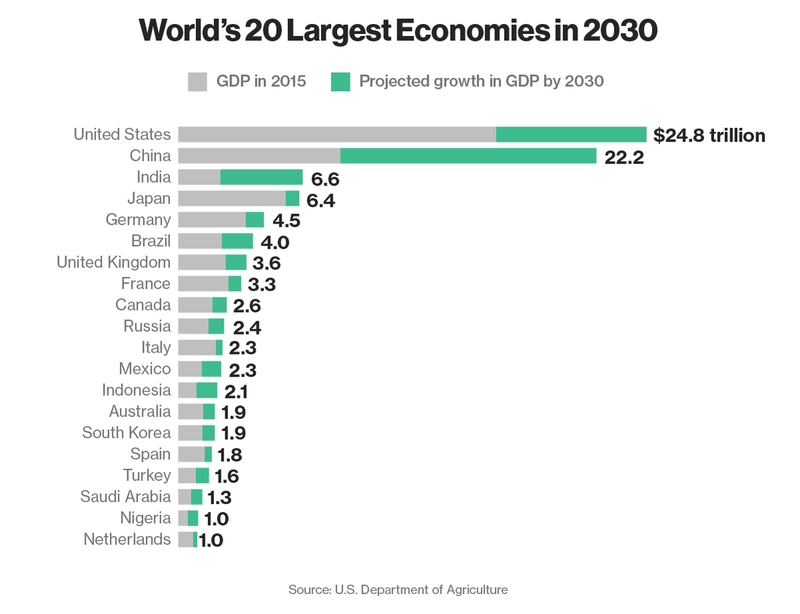 Agriculture sector already has a target of doubling farm incomes by 2022. This asks for agriculture sector to grow by more than 12% every year. This will certainly remain unachieved as the difference between the ambition and reality is wide enough. Still, we can aspire a target of 8%. Industry sectors growth was largely talked around 'Make in India' which could not make an impact beyond campaigning. With the effect of trade wars limiting the global boundaries for trade and possibility of high yields bond rates in USA, India is certainly going to lose foreign capital further required to pick the Industry sector growth up. Yet, in a hypothetical world, if I give a 8% target for Industry sector, that sets a target of 10% for service sector for achieving an overall 9% growth rate, assuming the share of each sector remains same as mentioned above. These are still ambitious targets and certainly, not easy to achieve. One should also not forget that as you grow further, keeping the same growth rate becomes difficult due to large base effect. Large public and private investments: for improving the Agriculture Infrastructure, irrigation facility, automation, cold storage facility, power needs. Rationalization of subsidies: Elimination of power, fertilizer subsidies which cause distortion in market prices, replacement of MSP support (for growth of non MSP crops) by Infra support. Others: Integrated farm management, easy credit and insurance support, ban on loan waiver for credit discipline, tech support, soil quality management, KCC, cooperative farming etc. . Taxation reforms : GST already present, needs better implementation and single rate in future, crude oil, ATF fuel, Alcohol within GST, bringing down corporation tax to draw better revenue and compliance. Others: Startup culture, MSME support, better implementation of newly designed policies : Industrial policy, Manufacturing Policy, exploration policy, foreign trade policy etc., link job creation with manufacturing, promotion of zero defect, low cost manufacturing to outcompete foreign products etc. This is a sector where India is already doing good. The scope and recognition could be expanded and formalized. Just like recognition of Services as Goods in WTO and alike multilateral institutions, will help in countering the trade deficit of goods with surplus in Services. Other improvements could be reforms mentioned in industry sector such as banking reforms, ease of doing business, labor, taxation reforms, support to product based startups etc. Hence, there is a lot to be done to bring India on the path of high speed growth. But one must also remember who is the driver of this train. It is not the highest political leadership who gets a mandate of five years to nudge but it is the age old bureaucracy that is all pervasive but walks slower than an elephant. My own assumption is that achieving a 5 trillion target by 2025 is more than possible, 10 trillion by 2030 is no way possible. However, there is a motivational theory in management by Edwin Locke, the Goal-Setting theory. He observed two groups of students before propounding his theory. First group was not given a target, the group built a block of 14 layers. The second group was then asked to build the block with a target of 19 layers. That group built up to 21 layers. When the first group was informed about second group’s attempt, they built up to 25 layers in second attempt. Such is the power of goal-setting. Edwin observed that specific and difficult goals with provision for feedback lead to high performance.